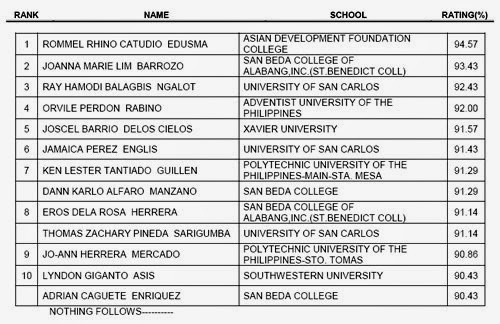 PRC releases July 2014 Certified Public Accountant Board Exam Results (list of passers, top 10, performance of schools) - Balita Boss! The Professional Regulation Commission or the PRC released the July 2014 Certified Public Accountant (CPA) Licensure Examination results. The official results were released on Friday, August 1, 2014. The examination was conducted by the PRC on July 20, 21, 28 and 29, 2014 in the cities of Manila, Baguio, Cagayan de Oro, Cebu, Davao, Iloilo, Legazpi, and Lucena. A total of 1,107 out of the 5,540 examinees passed the July 2014 Certified Public Accountant Board Exam, according to PRC (via PRC Website). ASIAN DEVELOPMENT FOUNDATION COLLEGE graduate ROMMEL RHINO CATUDIO EDUSMA topped the July 2014 Certified Public Accountant Board Exam with a passing rate of 94.57%. View or download the performance of school in the July 2014 Certified Public Accountant Licensure Examination at prc.gov.ph. The Board of Accountancy who administered the July 2014 CPA Board Exam were Joel L. Tan-Torres as Chairman, Betty C. Siy-Yap as Vice-Chairman with members namely Eliseo A. Aurellado and Gerard B. Sanvictores. Registration for the issuance of Professional Identification Card (ID) and Certificate of Registration will be on August 8, 11 & 12, 2014. The date and venue for the oathtaking ceremony of the new successful examinees in the July 2014 Certified Public Accountant Licensure Examination will be announced later, the PRC said. The CPA Licensure Examination covers the following subject: auditing problem and practical accounting problems II , theory of accounts and auditing theory, management services and practical accounting problems I and business law and taxation.